When you lose teeth, you may choose to get dentures. Dentures are replacement teeth which can be removed and put back in whenever you choose. They are not permanently attached to your jaw or gums. Whether a patient needs a partial or full set of dentures will depend on the individual case. When all of the teeth are removed, they are normally replaced with a full set of dentures. In the case of Conventional Full Dentures, after the teeth are removed, the gum tissue is allowed to heal before the dentures are placed. The gum tissue can take a few months to heal completely, and this means being without teeth for that period of time. The other option is Immediate Full Dentures. In the case of this option, your dentist will take measurements and have the dentures fitted for your mouth, before removing your teeth. The dentures are then placed in your mouth immediately after the teeth are removed. Naturally this gives the benefit of not having to spend any time without any teeth. However, because the jaw bone changes shape slightly as your mouth heals, you will need a follow up visit with your dentist, to refit your dentures. After the jaw bone has fully healed, the dentures will need to be tightened. 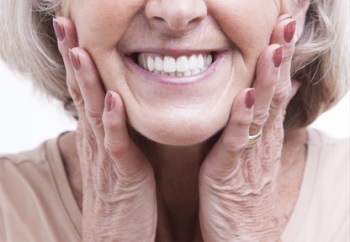 When it is not necessary to remove all of your teeth, partial dentures are an option. Although this is not a permanent fixture in your mouth, it is similar to a bridge. It usually takes some time to get used to dentures. The base of the dentures, which is flesh colored, is placed over your own gums. It is common to feel that the denture is bulky and that there is not enough room for the tongue. At other times, the dentures may well feel loose. The way you talk and eat can be affected by these feelings for a little while. But they will become easier to use over time, and your mouth will become trained to speak and eat comfortably with your dentures. They will start to feel more like your natural teeth as you get used to them. Although they may never feel completely comfortable and natural as your own teeth, it is certainly a better option than not having any teeth. Dentures need to be well taken care of, just like real teeth. Even though they are not real teeth, they still need to be brushed to remove food particles and plaque before being removed from your mouth. After removing them, place them straight into a denture cleaning solution, or room temperature water. Hot water could warp the dentures and should never be used. Take care not to drop the dentures since they are delicate. It’s also important to not try to adjust the dentures yourself as you could risk ruining them. Always ask your dentist for assistance if they feel loose or uncomfortable to you. A very popular method of enhancing the aesthetics of a smile is bonding. Bonding is used to cover up stains and discolored teeth, as well as correcting gaps and cracks in teeth, and as cavity filling. In bonding, the dentist uses a composite resin on the affected teeth. A adhesive gel is placed on the tooth, and the resin is sculpted and molded over that. An LED light is then used to harden the resin, and once it is hardened, it will be polished so that you have a fresh new look. It is clear that bonding is a huge improvement on the traditional silver amalgam fillings. Bonding generally lasts for over ten years, thanks to the advancements in dental technology. It is an attractive, safe and affordable dental solution for many problems. Dr. Lamb at Keystone Dental Center is a leading Colorado Springs dentist and has years of experience in fitting patients with dentures that are comfortable, work well and are affordable. Why not make an appointment today and learn if you would benefit from dentures or bonding. Call us at 719-596-0212 or make an appointment HERE.